THC production is high to very high with at east 20% being the norm. CBD levels are quite low at 0.45%. 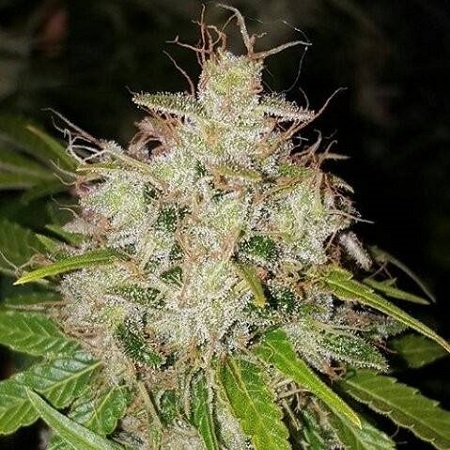 Deluxe Orange Feminized Cannabis Seeds by Lineage Genetics Seeds: Deluxe Orange is a 50/50 indica/sativa hybrid cannabis strain that is the product of an Orange Velvet x Jack the Ripper cross. Lineage Genetics claim that this Orange strain outperforms any other similar strain on the market today both in terms of yield and flavour/aroma. Deluxe Orange was originally created by a breeder who goes by the name Sonic. Lineage Genetics managed to acquire a stable pheno-type which exhibits all of the attributes that growers look for. In addition with the onset of cooler night temperatures during flowering this plant has the ability to display maroon and purple colouration which adds to the visual appeal. Deluxe Orange responds particularly well to training and, indeed, performs better as a result with a bush-like structure filled with copious amounts of large, fat, resin-drenched buds. Yields are very good with 600 - 700 gr/m2 being produced in a flowering period of 8 - 9 weeks. Outdoors too this is a plant with great potential with each plant capable of yielding 700 gr. or more with harvest time falling during the month of September. The earlier maturation date broadens its limits of cultivatability. The aroma is really quite special with the expected fresh orange and citrus scents producing mouth-watering sensations which follow through onto the palate. THC production is high to very high with at east 20% being the norm. CBD levels are quite low at 0.45%. The overall effect of Deluxe Orange is almost trippy in its potentially disorientating high.